While at the Smithsonian Libraries Research Annex (SLRA) during the second week of my Smithsonian Libraries internship, I was asked to select and research texts in SLRA’s collection for the Adopt-a-Book Program. Adopt-a-Book is an opportunity for bibliophiles to “adopt” a book from one of the Smithsonian Libraries’ twenty-one branches, granting them acknowledgement through a virtual bookplate in the SIL online catalog, SIRIS. Potential donors can view the books up for adoption on the Libraries website, along with a brief history and description of each. 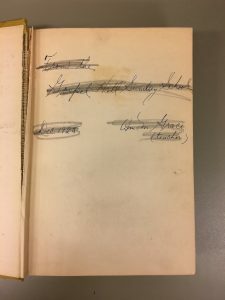 In addition to generating revenue, Adopt-a-Book is a great way to tell and preserve the stories of physical texts; as I quickly discovered, each book has a unique, often untapped past. SLRA’s collection is, as you would expect from a library that houses legacy material from every library across the Smithsonian, extensive. As I perused SLRA’s various shelves, which held books from seemingly every possible subject, I stumbled on the aeronautics section. Being someone with no particular affinity towards the science of air travel, I was prepared to move on to the next shelf. 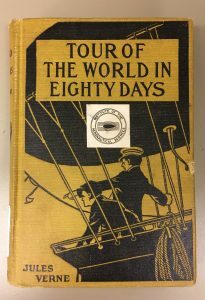 That was until I noticed a surprisingly familiar title: Tour of the World in Eighty Days by Jules Verne. 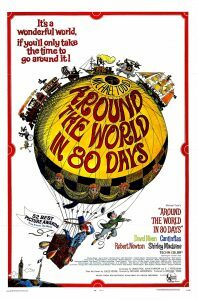 This conjured up memories of two films I had seen during my childhood, both titled Around the World in 80 Days, one having been released in 1956 and the other in 2004, which paid tribute to Verne’s classic adventure tale. The story was then familiar to me, and as I picked up the dusty book and examined its cover, I began to recall the story that had been told and retold for nearly a century and a half. Tour of the World traces the exploits of a wealthy British man named Phileas Fogg and his valet Jean Passportout. The story begins in London in 1872, where Fogg becomes convinced that circumnavigating the world in eighty days is possible given the technological breakthroughs of his time. This (and a £20,000 wager) inspires a global journey to various locations including Suez, Egypt, Bombay and Calcutta, India, Victoria, Hong Kong, Yokohama, Japan, San Francisco and New York City, through which the pair successfully navigates in less than eighty days. While the story is itself fictional, the book was written and set during a period in which Verne, like many of his contemporaries, looked to the world with excitement as the technological and industrial achievements of the time expanded global travel opportunities. Such breakthroughs included the establishment of the first Transcontinental Railroad in America in 1869, the linking of Indian railways across the sub-continent during 1870, and the opening of the Suez Canal in 1869. Verne’s appealing to this sense of wanderlust accounts for much of his book’s popularity during his lifetime. The book’s greatest success however can be found in its near 150 year following since its initial publication in 1873. Verne’s tale has been republished in to several languages, inspiring various films, television shows, radio series, and theater productions. As I held SLRA’s copy of Tour of the World in my hands, I began to wonder when it was produced. With no publication date, an annotation on its inside cover dated ‘1925,’ and a blind stamp minted 1932 on the title page from the Institute of the Aeronautical Sciences, the book posed questions I did not initially have the answer to. I treated these supposed dates as a starting point for my research on the text. I soon uncovered an inconsistency in the book’s appearance and presumed date(s) of publication. 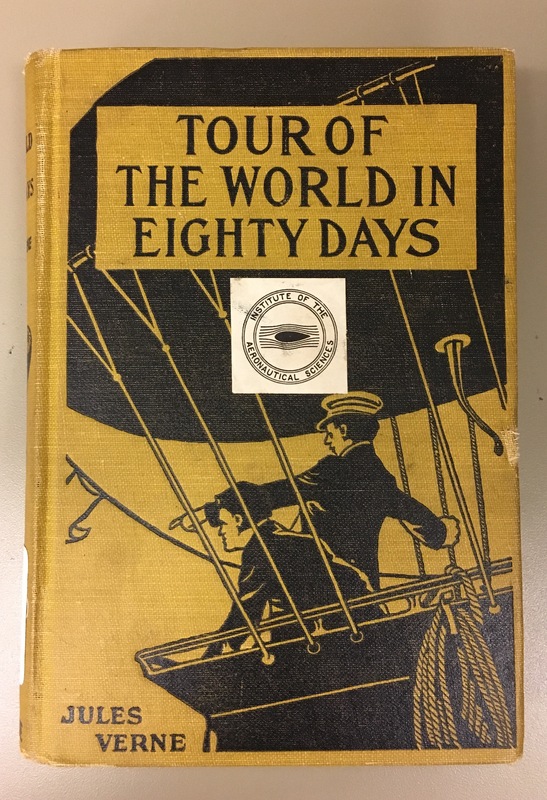 When I first looked at this copy of Tour of the World, I mindlessly assumed that the cover depicted Fogg and Passportout in a hot air balloon, navigating the skies on one of their many voyages. Yet, upon researching the story’s history further, I discovered that hot air balloons are not actually present in the text, say for in Chapter 23 where Fogg proclaims that traveling in one would be “highly risky and, in any case, impossible.” So why did this particular publication, along with so many others, feature hot air balloon imagery on their covers? I then discovered that the famous hot air balloon did not become part of the book’s mythology until after the release of the 1956 film adaptation, wherein Fogg and Passportout use a hot air balloon to travel from England to Spain. Since the release of the film, the balloon has been celebrated as a hallmark of the story, despite its absence in the book. The image of the hot air balloon became so pervasive that republications of the novel began to feature it on their covers. This conclusion, I thought, solved the mystery of SLRA’s copy’s publication date. But it did not. While the copy I selected had no publication date, it seemed impossible for it to have been printed following 1956. The two dates which had been inscribed onto it suggested that the book was produced sometime prior to 1925. In my increasingly desperate attempt to locate SLRA’s Tour of the World’s elusive past, I discovered that booksellers who owned other copies of the same publication grappled with a similar dilemma. “No date,” “1900-1950,” and “Later edition,” were all common phrases I encountered in the descriptions of each copy up for sale. Ready to admit defeat and concede that I would never uncover the book’s history, I decided to consult the web one last time. Rather than search up the publication history of Tour of the World, I looked up information regarding the book’s publisher, M.A. Donohue & Company. I had encountered the name in my research on the text, but only rarely, as the small, Chicago-based publisher had been shut down since the early 1960s. I discovered that during its near one-hundred year existence, Donohue released several series focused primarily on fiction and children’s literature. These series were typically divided in to categories based on subject matter, such as science fiction, adventure, or “Boy Scout” literature. To my delight, I discovered that Donohue had not only released Tour of the World in one of its many adventure series, but also eleven other Verne novels. Verne’s works were dispersed among Donohue’s many series collections, making it one of the first American publishers to release Verne’s books for North American audiences. Interestingly, Verne titles included in any Donohue series featured the same image on their covers – two men in a hot air balloon. The covers of each varied only in color and some extra detailing. For instance From the Earth to the Moon depicted the token hot air balloon scene found on Tour of the World, but a moon was added to a blue background. Online resources did not specify when Donohue released each of Verne’s works. 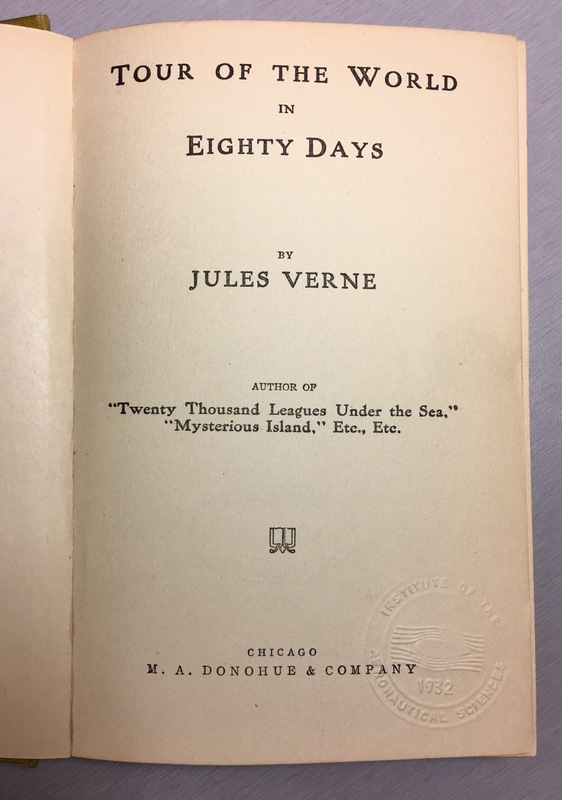 However, critical examination of SLRA’s copy of Tour of the World suggested that Donohue’s Verne titles were published after 1901. Upon its establishment in 1861, the publisher had been referred to as Donohue & Henneberry and it was not until 1901 that it was renamed M.A. Donohue & Company. 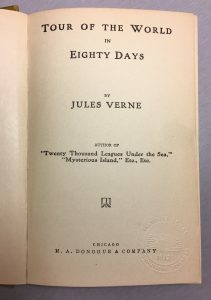 SLRA’s Tour of the World, as well as digitized versions of other Verne works published by Donohue, all featured the latter name on their title pages. This, then, supported the date inscribed on the inside cover of SLRA’s copy – which indicated that it was published prior to 1925 – and in doing so, my ‘eureka!’ moment. 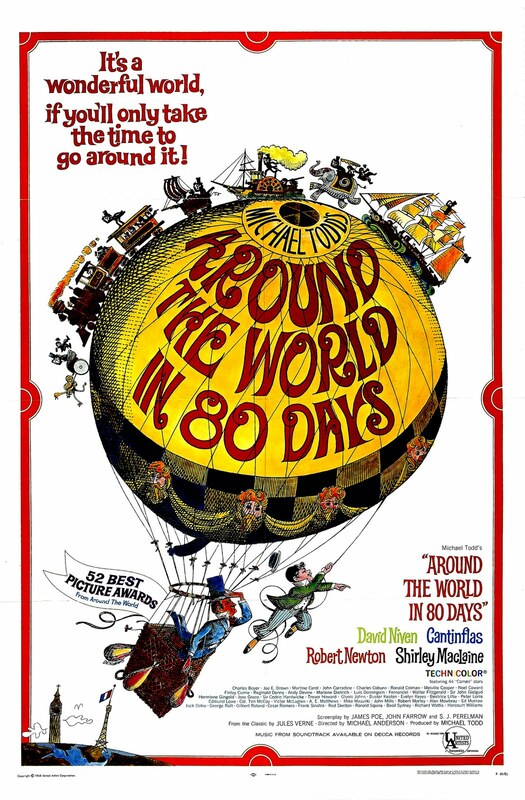 So, Donohue’s copy of Tour of the World is an anomaly, as it featured hot air balloon imagery on its cover before the quintessential image became mainstream after the release of the 1956 film adaptation. Donohue’s cover was likely an ode to one of Verne’s first published works released in 1863 titled Five Weeks in a Hot Air Balloon. This adventure tale traced the travels of English explorers and scholars across the African continent via a hydrogen balloon, which many literary critics have since cited as the foundation for Verne’s later works. The process of researching SLRA’s copy of Tour of the World reminded me of the joys that books bring, not just in terms of their contents, but through the actual mystery their physical presence commands. Even to readers familiar with a given book’s story, the experience of reading it, processing it, holding it, wondering whose hands it passed through, is invigorating. I knew Verne’s classic adventure tale well prior to picking it up, but the journey it took me on was entirely unexpected. That, I think, is a testament to the wonder that surrounds books, making libraries like SLRA, that house and protect them, all the more necessary. Click here to view SLRA’s copy of Tour of the World up for adoption. For more on Jules Verne, head to the Smithsonian Libraries’ Fantastic Worlds, an interactive site dedicated to tracing the fiction inspired by 19th-century discoveries and technological innovations.